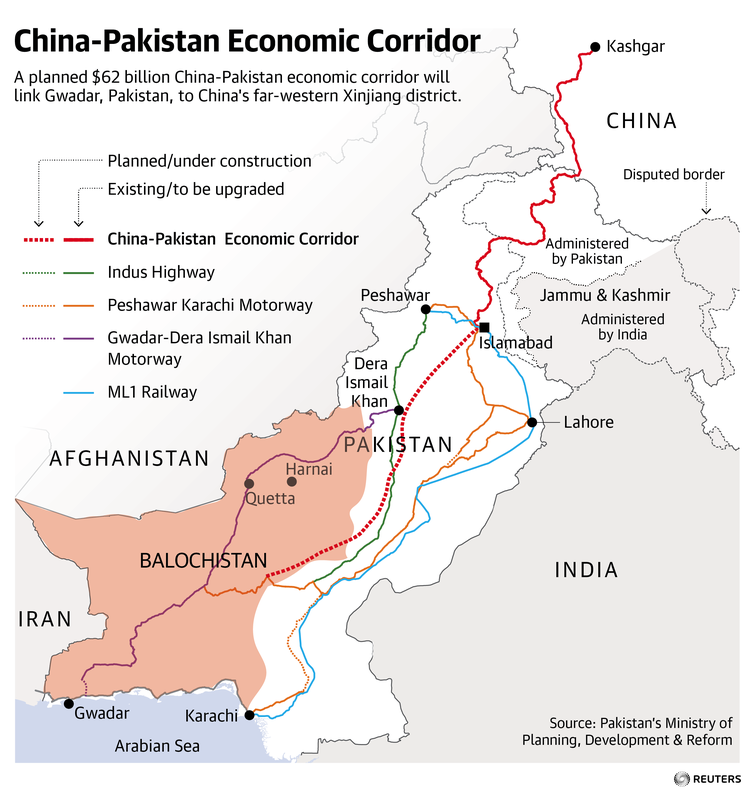 For the Chinese, there are clear reasons to run the risks of investment in Balochistan, one of the world’s wildest frontier regions. Gwadar will be a critical addition to Beijing’s so-called string of pearls: a ring of ports around the Indian Ocean, including in Sri Lanka, Djibouti and the Seychelles, which are intended to outflank China’s nuclear-armed rival for supremacy in Asia: India. Violence over the past few months has left Beijing in no doubt of the risks. In June, Islamic State militants killed two Chinese language teachers, who were snatched from the streets of Balochistan’s capital, Quetta, by men disguised as police officers. That came only weeks after two gunmen on motorcycles shot dead 10 laborers building a road linked to the Chinese investments around Gwadar. More than 20 people have died in bomb attacks against military units in the past few days. It is little wonder, then, that Pakistan’s new prime minister is scrambling to convince the Chinese that their investments are safe. The murder of the teachers was the most direct attack on Chinese citizens since three engineers were murdered in Gwadar in the early days of Beijing’s interest in the region in 2006. To underline the show of solidarity, Chinese Vice Premier Wang Yang travelled to Pakistan on Monday to join the celebrations for the country’s 70th independence day. The scale of the Chinese investment, however, means Pakistan has to negotiate a domestic political minefield. Many in Balochistan feel aggrieved that they will never see any of the cash from Beijing, which would either be seized by the other provinces or would turn into profit back in China. It is these discontented Baloch who pose the most stubborn threat to China’s plans. For China, a strengthened Pakistan helps muscle out India, which has long been Beijing’s main foe across the Himalayas. Baloch spokesman Kakar spoke to POLITICO in May while on an official visit to Brussels with senior Cabinet members from the provincial government. After a sweeping military operation began in 2014 to clear out militants, the delegation believed the time was ripe for investors to sell Balochistan in Europe, styling it the “rising dark horse” of South Asia. Despite the delegation’s visions of a modern trade and tourist hub, the residents complain about a lack of drinking water. Many went on strike in June to protest against dismal progress on a promised desalination plant, shuttering their businesses. Baloch separatists accuse the country’s military — and particularly a paramilitary force called the Frontier Corps — of conducting extrajudicial killings and “disappearing” opponents. It is difficult to independently verify estimates of casualties in the “dirty war” between the insurgents and the security forces, which has been going on for years. Official statistics indicate that more than 4,500 bodies of forcibly disappeared people were recovered between 2010 and 2015. For China, a strengthened Pakistan helps muscle out India, which has long been Beijing’s main foe across the Himalayas. The two countries fought a war in 1962 and soldiers again clashed along the Himalayan border this week. There is also a soft-diplomacy dimension to China’s investments. A television advertisement that went viral in Pakistan — and spawned parodies — shows a Chinese woman bonding with her Pakistani neighbors over a spicy platter of biryani. More Pakistanis are also learning Mandarin than ever before. Chinese performers sing patriotic Pakistani songs on Chinese TV, and China Radio International launched a new station on Pakistani airwaves called “Friendship Channel.” The Chinese Embassy in Islamabad did not respond to a question on how many Chinese residents there are now in Pakistan, but the number is easily in the high thousands. Still, amid the bonhomie, it’s impossible to discount the core strategic worries.